Puget Sound Soaring Association, Inc. 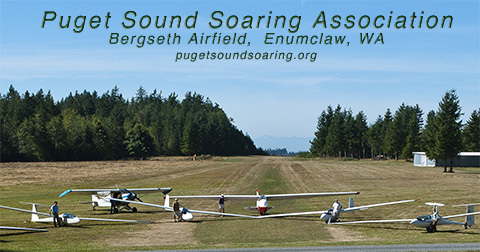 Welcome to Puget Sound Soaring Association, Inc.
PSSA operates weekends March through October just Northeast of Enumclaw, Washington adjacent to the Western slopes of the Cascade mountains. Please refer to our map for directions. Before you make the trip, be sure to call our operations message at 206-660-0019 after 9:30am to get the latest status on the days schedule as we may need to cancel due to weather or other unforeseen problems. PSSA has several FAA-certified flight instructors, who can prepare you to take your FAA pilot exam. With no prior flight experience, you can solo after 30-40 instructional flights. After another 50-60 flights, you will be prepared to take your Private Pilot check ride with an FAA designated pilot examiner. You'll also have to pass the FAA written knowledge test. The training time and required number of flights highly depend on how frequently you're able to fly. If you are already a rated aircraft pilot, you can take your first glider solo flight and take your check ride after a considerably shorter training. PSSA offers a versatile environment that suits the needs of most pilots. We own a Piper Super Cub towplane and a good variety of glders; we run continuous flight instruction on weekend days. Our airfield (which is exclusively used by us) is located at the foothills of the Cascades and offers a great environment for ridge- and thermal soaring. We're at a convenient location, just four miles northeast of Enumclaw, WA. Copyright © 2019 Puget Sound Soaring Association, Inc.